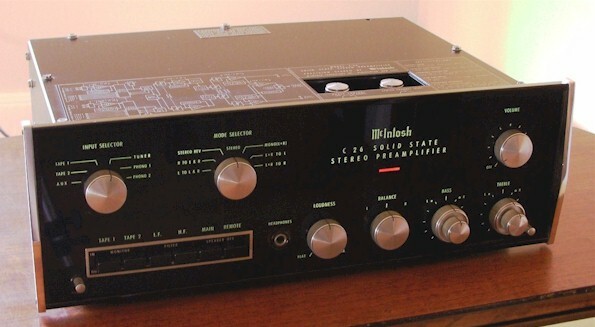 In addition to my Bryston amp, I'm also selling my McIntosh C26 Preamp. Works as new (or near enough to it that my ear can't tell the difference), and I would call cosmetic condition excellent. I realize that can be a very subjective area, so I have taken 15 hi-res photos so that potential buyers can judge for themselves. The thumbnails load to very large photos. The unit has a few light scratches here and there on the body, but is overall very sweet. There is not a single scratch anywhere on the glass that I can see. Cosmetically, it has two flaws: it's missing one screw on the upper right topside corner (look closely at some of the photos - it's visible), and there is a tiny patch of underglass peelage on the far lower right of the bottom of the face. I tried unsuccessfully to photograph it - just kept getting reflections of my tripod, or my feet :-) It's about an inch long, and maybe a quarter of an inch high - very small. Again, the whole glass front itself seems absolutely excellent, no scratches, chips, dings, or cracks at all. Will ship in a McIntosh box which will be 'floated' inside a larger exterior box, nestled in foam, via UPS Ground to continental U.S., insured, adult delivery signature required. (Buyer to pay actual shipping only, I would never charge a 'handling' fee.) Personal check, money order, or Paypal ok if verified & buyer pays the % fee (I am a verified U.S. PayPal account-holder). More than welcome to pick up, if you happen to be anywhere near Ithaca, NY.